The Martian Active Voice Command series mixes smartwatch tech with an analogue watch face but can it seamlessly blend notifications with traditional style? Martian recently launched this new set of hybrid smartwatches in its voice command line, the Martian Active Collection. The new collection incorporates the same unique connected features as the Martian Voice Command smartwatch, but is updated with this more stylish, polished look. It also follows the Guess Connect collaboration which was the first commercially available designer brand smartwatch on the market. The Active collection recently launched worldwide and we have been able to test the $279 Aviator B10 model. Read on for our thoughts. 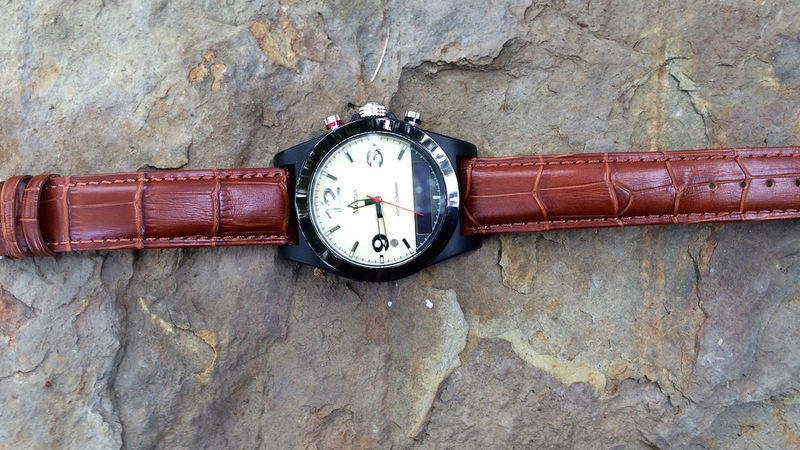 This particular model is designed to look like a vintage pilot's watch. It features cockpit style numbers and hands and the face has a slight yellowish hew to emphasise the antique theme. The case is made from a durable nylon resin with a scratch-resistant mineral glass. The removable band is made from genuine leather with an alligator pattern and has a classic buckle made of stainless steel. The Aviator B10, which is a men's model, has significant weight. It's not that the watch is heavy, but you can feel it on your wrist. You know it's there. 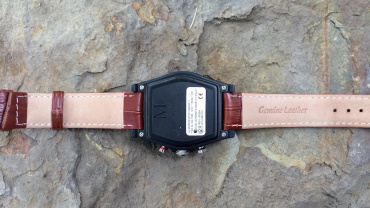 The watchcase measures 40mm wide and 15mm thick. It is fairly average for a watch, especially a men's model. The women's model features smaller straps, but crucially the watch face remains the same. It felt a little bulky on my wrist, but I got used to it. However, some ladies might find the size an issue. There are three buttons on the right side of the watch face, as well as the microphone. The top button, designated with a red band, activates voice command, which connects to Siri, S-Voice, or Google Now. The middle button is the crown, which is used to set the time on the analog watch, and the bottom one, designated with a black band, turns the watch on and off, shows the status menu, and toggles through the watch menu options. 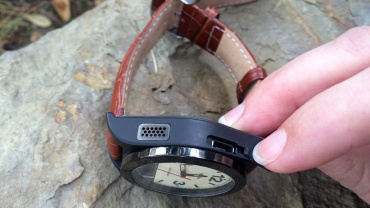 There is also a micro USB port on the left side of the watch for charging the device, and a small speaker. 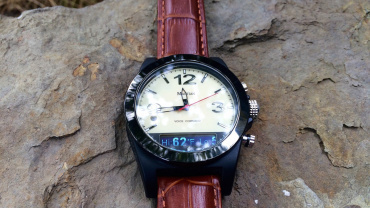 The watch face features an analog clock with a sweeping second hand. In the bottom quarter of the face sits the OLED status ticker. This is where you can read your smartphone's notifications. There is also an LED indicator, which lets you know when you are getting incoming calls, activating voice commands, and when your battery needs charging. The goal of the Martian smart watch is to look like a watch first and foremost, which it does terrifically, and provide some smart features second. It has a handful of key features that really make it a solid hybrid smartwatch. You may not get everything that Android Wear or watchOS can provide, but you will be able to stay connected the way a smartwatch should. You can get notifications sent to the watch, which you can read right on the watch face. You'll never forget your smartphone with the Leash feature, which lets you know when you are out of range. Plus, the Voice Command feature gives you total access to your mobile virtual assistant, who can perform all manner of actions for you, hands and eyes free. But, we'll get to all of that later. The Active collection provides special "smart notifications" sent from your smartphone, which are customisable vibrations that you assign to each of your apps. For example, you can assign two short vibrations to text messages and one long vibration for Facebook. That way, without even looking at your wrist, you'll know what notification just came in. You can also set up to five silent alarms from the companion app. Silent alarms will keep you on track without interrupting others. Set a silent alarm to wake you up and let your partner sleep right through it. One very useful feature of the Martian Watch is the "Leash." With Leash enabled, you'll never stray too far from your smartphone without knowing about it. The watch sends you an alert if you move too far away from your device – or if it moves too far away from you. That's the idea, anyway. Of course it is dependent on Bluetooth but the range of the Leash is somewhat limited. We found that, with the smartphone in the living room and the watch in the bedroom, the alert would trigger. So, even when you haven't left the house yet, you might get a reminder that you've forgotten your phone. You can use your Martian watch to take pictures or videos on your smartphone. The bottom button can be used as a shutter trigger. So, you can set up your smartphone for the perfect shot. Then, walk away from it and hit the camera button to snap the picture. When in camera mode, you can also press and hold the button for a two-second delay. The most unique feature of the Martian Watch is Voice Command, which lets you communicate with your virtual assistant, like Siri, S-Voice, or Google Now. Not only can you use Voice Command to perform actions, like making a phone call, but you can also have your digital personal assistant read your text messages or new mail, right on your Martian Watch. Voice Command is, by far, the standout feature of the watch. Whatever you can do with Siri or Google Now on your smartphone, you can instead do on Martian Watch. On Martian Watch, press the top button to activate your personal assistant. Then, ask for help. You can schedule events in your Calendar app, take notes, set reminders, and more. You never have to take your smartphone out of your pocket to perform any of these tasks. When it comes to reading back your emails and text messages, Siri is played back through the Martian Watch, so will hear the audio from your wrist. Siri reads the headlines of each unread email and you can ask the personal assistant to read a specific email in its entirety. You can't even do that on Apple Watch. You have to, instead, switch over to your iPhone to have Siri read to you. Of course, because the messages are read out loud, you wouldn't want to check your emails while you are in a meeting or on the bus, or in any public setting for that matter. However, it is very convenient to have your emails and text messages read to you while you are driving. With the Martian Watch you are eyes free the entire time. Simply press the top button to wake Siri up. Then say, "read my emails" without having to look down at your screen or hold your iPhone in your hand. The microphone and speaker are also much better than most smartwatches. Phone calls come through much clearer with less noise and breaks. In short, I prefer making and receiving phone calls on the Martian Watch over Apple Watch. Seriously. Since the Martian watch has limited features on the device itself, the app is where you do all of the dirty work. Not only do you set up alarms and adjust the vibration intensity, but you also set up which apps you want to receive notifications from. Anything app that offers notifications on your smartphone can be customised in the Martian companion app. There is already a list with the most popular social apps. However, any app you already have set up with notifications will appear when you receive an alert after you connect your Martian watch to your device. Through the app, you can change what information is displayed on the watch face ticker. Set the time zone for the clock, turn on or off the weather forecast, and switch between Fahrenheit and Celsius. In the settings section, you can turn the LED light on or off, so it doesn't blink whenever you get a notification. You can also toggle off the leash feature so you won't get an alert whenever you smartphone is too far from your watch. Additional settings options include speeding up or slowing down the ticker, enabling gestures, choose your time format, and more. Martian promises up to five days of battery life for the smart features and as much as two years for the analog watch. We can't attest to the analog watch battery's true life expectancy. However, the rechargeable battery for the smart features lasted closer to three and a half days with a lot of active use. The battery charges to full within just a couple of hours time using the included micro USB cable but considering what it's offering, you might be hoping for slightly longer. 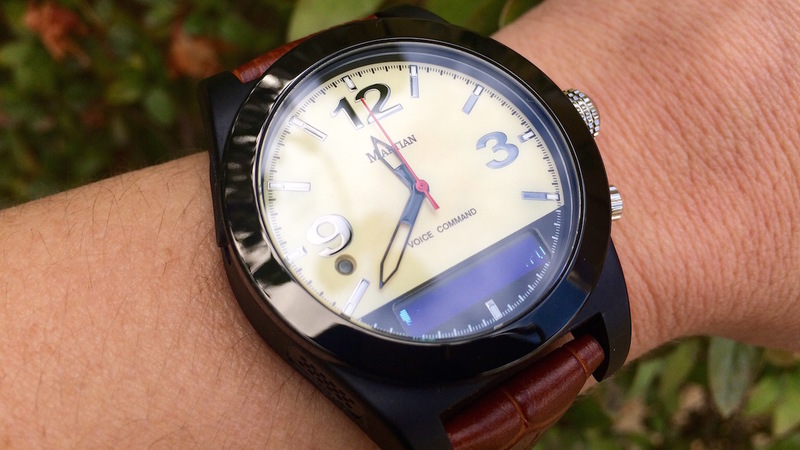 As hybrid smartwatches go, Martian's Active line is pretty top notch. Voice Command is definitely a huge selling point since it allows you to communicate with your smartphone while being totally eyes-free. Although a little too big for small wrists, the design is very nice. It looks just like a traditional watch in most ways. Connection problems have been a pain and considering the lack of a full face LCD, we'd have liked a better battery life. But if you don't think you are ready to go full smartwatch, this hybrid is definitely one of the best in terms of features and reliability.